Don’t be caught in ice and snow this winter without a dependable ice melt packager. The TruMelt™ brand includes 4 ice melt blends with melting effectiveness from 0° to -20°. Compare ice-melt products before you buy! Make sure you know what is in the bag before you buy. Many ice melt blends have very little magnesium or calcium mixed into the blend. Ice-melt products are often sold without full disclosure of melting ingredient. We disclose the exact percentage of blended magnesium or calcium. We are committed to help distributors understand how ice-melt products perform under ice and snow conditions. We listen to your needs and offer real solutions. In the end, we want our ice melt products to go beyond your expectation. Give us a call. TruMelt™ 3% is a premium blend of 97% oven-dried, screened sodium chloride and 3% magnesium pellets. Snow-fighting professionals who are looking for full disclosure of ingredients need look no further. TruMelt™ is true to its name. We disclose the truth about ingredients and true effectiveness. TruMelt™ 3% is the economic choice for commercial and residential applications. Due to the inclusion of 3% magnesium pellets, it melts effectively down to 0°F. TruMelt™ 3% is screened to optimal crystal size for maximum traction and accurate spreading. Small dusty fines and large crystals above ¼ inch in diameter are removed. TruMelt™ is more free flowing than any ice melter on the market and provides a clump-free product for ease of application. TruMelt™ 3% is very lightly tinted with a non-staining organic (biodegradable) green colorant to enhance accuracy and visibility. It is non-staining and safe for sidewalks and floors. 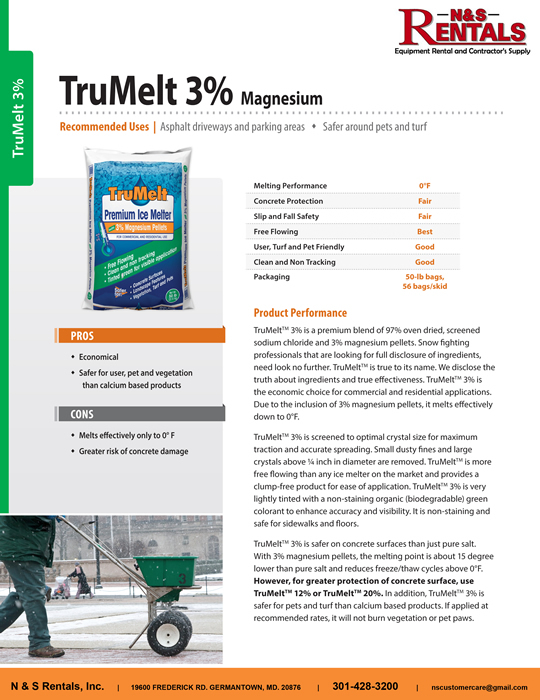 TruMelt™ 3% is safer on concrete surfaces than just pure salt. With 3% magnesium pellets, the melting point is about 15 degrees lower than pure salt and reduces freeze/thaw cycles above 0°F. If applied at recommended rates, it will not burn vegetation or pet paws. 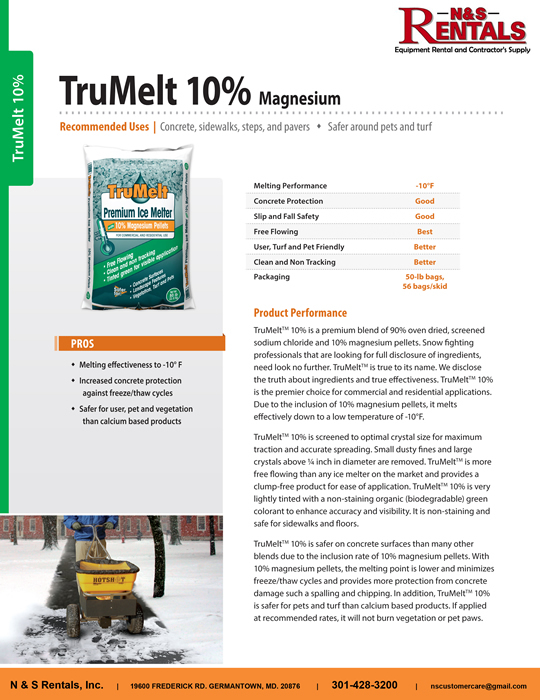 TruMelt™ 10% is a premium blend of 90% oven-dried, screened sodium chloride and 10% magnesium pellets. Snow-fighting professionals who are looking for full disclosure of ingredients need look no further. TruMelt™ is true to its name. We disclose the truth about ingredients and true effectiveness. TruMelt™ 10% is the premier choice for commercial and residential applications. Due to the inclusion of 10% magnesium pellets, it melts effectively down to a low temperature of -10°F. TruMelt™ 10% is screened to optimal crystal size for maximum traction and accurate spreading. Small dusty fines and large crystals above ¼ inch in diameter are removed. TruMelt™ is more free flowing than any ice melter on the market and provides a clump-free product for ease of application. TruMelt™ 10% is very lightly tinted with a non-staining organic (biodegradable) green colorant to enhance accuracy and visibility. It is non-staining and safe for sidewalks and floors. TruMelt™ 10% is safer on concrete surfaces than many other blends due to the inclusion rate of 10% magnesium pellets. With 10% magnesium pellets, the melting point is lower and minimizes freeze/thaw cycles and provides more protection from concrete damage such a spalling and chipping. In addition, TruMelt™ 10% is safer for pets and turf than calcium based products. If applied at recommended rates, it will not burn vegetation or pet paws. 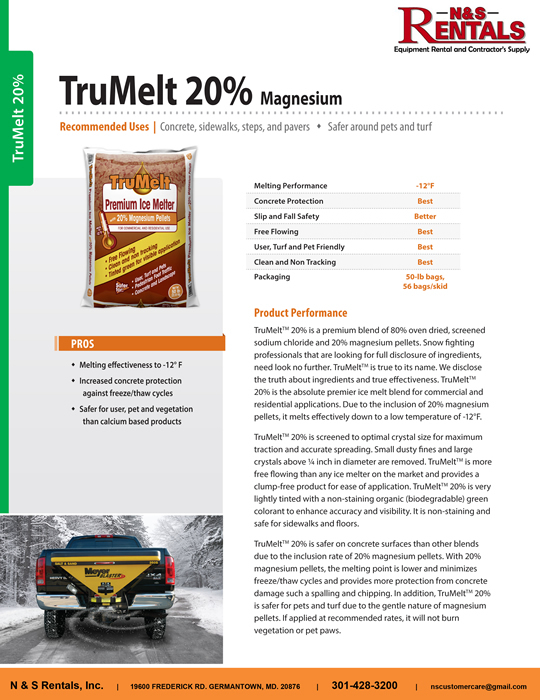 TruMelt™ 20% is a premium blend of 80% oven-dried, screened sodium chloride and 20% magnesium pellets. Snow-fighting professionals who are looking for full disclosure of ingredients need look no further. TruMelt™ is true to its name. We disclose the truth about ingredients and true effectiveness. TruMelt™ 20% is the absolute premier ice melt blend for commercial and residential applications. Due to the inclusion of 20% magnesium pellets, it melts effectively down to a low temperature of -12°F. TruMelt™ 20% is screened to optimal crystal size for maximum traction and accurate spreading. Small dusty fines and large crystals above ¼ inch in diameter are removed. TruMelt™ is more free flowing than any ice melter on the market and provides a clump-free product for ease of application. TruMelt™ 20% is very lightly tinted with a non-staining organic (biodegradable) green colorant to enhance accuracy and visibility. It is non-staining and safe for sidewalks and floors. TruMelt™ 20% is safer on concrete surfaces than other blends due to the inclusion rate of 20% magnesium pellets. With 20% magnesium pellets, the melting point is lower and minimizes freeze/thaw cycles and provides more protection from concrete damage such a spalling and chipping. In addition, TruMelt™ 20% is safer for pets and turf due to the gentle nature of magnesium pellets. If applied at recommended rates, it will not burn vegetation or pet paws.